Setting up a dialogue between Jackson Pollack and David Hockney offers a promising introduction to an exhibition that looks at the relationship between painting and performance over the past sixty years. Pollack’s Summertime No.9A demonstrates all of the intuitive release that flows out of his technique of placing the canvas on the floor thereby reasserting its materiality and intrinsic character as an object made through the application of paint to supporting surface. This is an art of impulse and wilfulness. He does not analytically study a subject to copy or describe it but acts in the moment fluidly moving through space to take the picture forward to a completion. Much has been written and said about Pollock’s methods and goals but when you see one of his mature paintings in the flesh their undeniable energy and restlessness demand consideration and ultimately respect for their insistent details of layered loops of paint. Within the exhibition the gallery takes the painting off the wall and returns it the floor, its place of origin and reminds the viewer of Pollock’s performative ritual. The image we see is part of a process and not an end in itself. To comprehend the revolutionary impact of this approach, we need to see it at our feet. 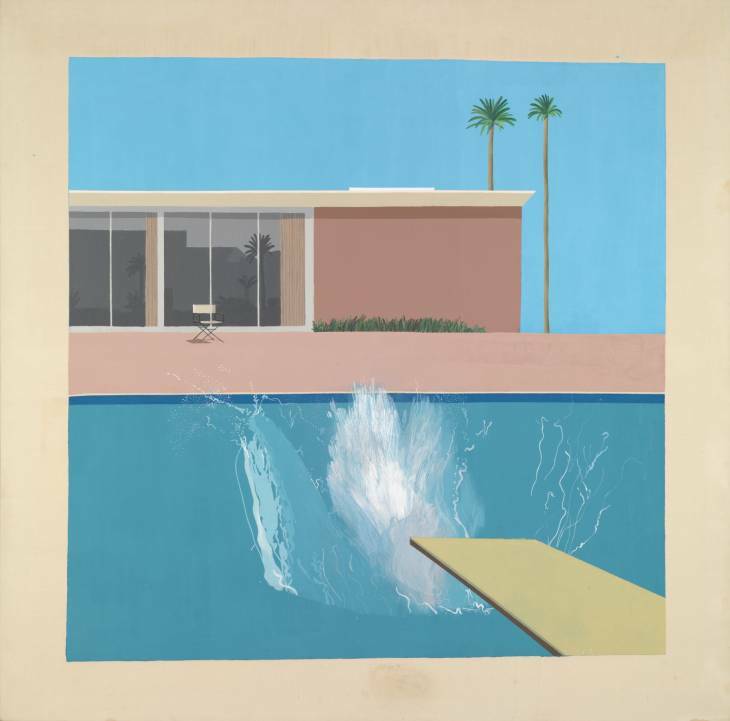 Hockney’s ‘A Bigger Splash’ elevates intellect and deliberation. Taking two weeks to paint the splash of water following an imaginary dive from an absent figure plunging deep into the water, Hockney privileges the viewer with a photographic freeze-framed image of displaced water. Looking at this complex spray of lifted white crested water, we know this is a device that reinforces the artificiality of painting and its translation of the observed world into fiction and effect. Water is never still in this way but moves so fast that it becomes a memory rather than something seen. Hockney’s emphasises both movement as stillness in this picture. The Californian bungalow glows hot colours in the sunlight and the palm tree takes carries Hockney’s desires as a Yorkshireman abroad searching for artistic and sexual freedom during the early 1960s. A Bigger Splash is an act of homage to Hollywood and a fantasy incorporating stereotypical motifs but he lends it an uncanny air rather like a De Chirico painting that suggests human activity through absence. So this is a work of synthesising different ideas and sources together to make something that is the antithesis of Pollock’s spontaneous dropping of paint. These two paintings illustrate two critical themes in the exhibition: performance and staging. Sometimes these tactics come together so that they are not necessarily in opposition. The curators quote Allan Kaprow the pioneer of performance who says that after Pollock artists had to incorporate the performative, ‘real time’ element or give up painting entirely. We are led through Yves Klein, Niki de Saint Phalle and the Viennese Actionists who in turn take the act of painting towards a theatrical and improvised status. Where the exhibition begins to totter on the edge of relevance is the inclusion of artists exploring identity through disguise and characterisation such as Bruce Nauman and Cindy Sherman. Here make-up is literally taken as a proxy for paint applied to the body but now the show feels quite removed from either Pollock’s or Hockney’s concerns which we experienced in the first room. The second half of the exhibition meanders even further from the thematic frame with a focus on individual artists working on installations that operate as sets or tableaux. Edward Krasinki’s application of blue lines of tape at a consistent height around the walls and across suspended mirrors raises interesting questions about control and autonomy at a time of political totalitarianism but feel like a digression. Further on we encounter a very stylised representation of Jean Cocteau’s world in an imaginary room by Marc Camille Chaimowicz that fails to convey much interest beyond contrivance. This is a theatrical set made inert by the absence of any performance. Jutta Koether’s ‘The Inside Job’ connects one painting to the response of visitors in New York to the picture hanging inside a rented apartment but illustrates the problems of exhibiting a historic project outside the parameters of its original environment and audience. This is a challenge for exhibiting work related to performance beyond its original environment. Joseph Beuys managed to invest his objects and vitrines arising out of his performances with an enduring vitality. In the final room of this exhibition Lucy McKenzie’s beautiful hanging screens that masquerade as flat painted sets evoke that uncanny displacement and uncertainty we first found in Hockney’s Californian hedonism. Now McKenzie has given her illusions a life-sized architectural presence, which are subsequently taken further into fiction as sets for an accompanying fictional film. So what we discover inside this rambling exhibition a few moments when painting’s relationship to performance is explicit and appropriate but often the argument begins to ramble. Pollock and Hockney though remind us of painting’s power to reconnect us to urgent expression on the one hand and intricate invention on the other.